Club Penguin Cheats by Mimo777 Club Penguin Cheats by Mimo777: 12 Tootastic Days! So let's Party! Lots of FREE STUFF! 12 Tootastic Days! So let's Party! Lots of FREE STUFF! Tootsville is giving away LOTS and LOTS of free items! It's time to give away a few Tootsville secrets right now YEAH! Tootsville is kicking off it's 12 days of giving stuff away! YES! 12 days starting saturday the 12th you will be able to get all sorts of cool items in Tootsville. I got a chance to sneak some peeks and they really have some cool ideas. The lighting of the christmas tree in Tootsquare will be at 12:00 est. I have it from good sources that Snowcone and Jack will be there to make sure Shade doesn't mess things up... but Shade never seems to play by the rules anyway! BOO SHADE! The Snow Castle will be open and you will be able to get a different Pivit everyday! I'm pretty sure you will have to be a VIT to get those but there will be some stuff for everyone. They are starting to hide a lot of items around different worlds so keep checking in with me and I will let you know when I find them, or let me know if you find them! HERE ARE A FEW TOOTSVILLE MIMO SECRETS SO FAR! Try the recipe its pretty good! You can buy stuff for your house! The Elf Hat is in the tower! Inside the ice castle is really cool! 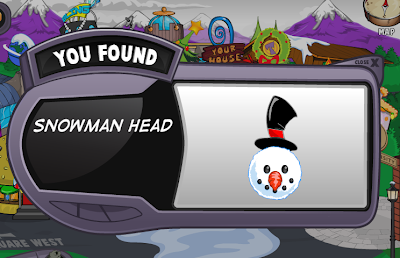 Snowman head is behind the snowman in tootsquare! I WILL SEE YOU THERE! CLICK HERE TO CHECK IT OUT NOW! cool place. i cant wait. see you there. thanks for telling us! but look back at mimo's old posts, he already posted about it.....but thanks again! maybe someday you will find something out before mimo does! if you do he will post your name. cool place. cant wait until the tree lighting. see you there. Yep, mimo posted about that already. Pretty cool huh! Mimo already posted that, scroll down. Cool, I want a tootsville now. But I already have too many games. awesome mimo im going to make an account on tootsville now! And.... do you really love wasabi? lolz! Wasabi is like mega spicy! thanks for the awesome tootsvile cheats! 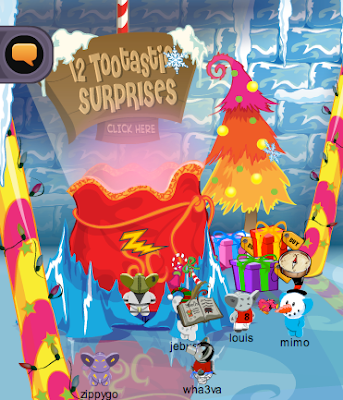 Congratulations to Zoo2 who won the Membership for helping out Mimo! Hope you spend crazy $ with it! Sorry but Mimo already did post this if you scroll down on the home page so sorry. But still thanks for trying to help the Gang! Mimo,your so lucky.I have a blog on toots and I never got a sneak peek! :-[ And my blog got over 160 hits the other day! Anyways,it looks fun.I hope to see you there! So I cam never go to anything like this!! no one in england is awake at 5:00 am!!! do u have to be a member to get htat stuff?? YES I'm not the only one!! Right, if Americans had to wake up at 2 or 5 they wouldn't be on. So why should people living in England have to? They should make sure it's like club penguin so anyone around the world can meet! reviwed by you is out Mimo! How do you get there!Its not on there yet!!!! PS I love the game! Sorry if i talk about it too much mimo! I will probaly be there. Same here--my mom says no. And i can't go onto any website on my computer, either. My parents have to enter a password for me to be able to go there, and they haven't even unblocked Wiglington and Wenks OR Webosaurs yet! I want a Twitter, so thats what i've been asking for recently... that and a dog. LOL! Awesome! But Mimo already posted this. Most likely, yes, you do have to be a member. Hey mimo I'm back. My internet died. They probably just released it for a little while to give him a sneak peak. Hope this helped! They gave him a sneak peak. IT should be out on saturday. Hey mimo! 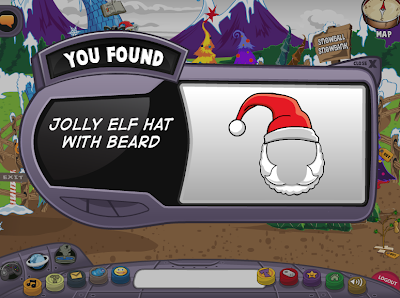 I got a greap scoop for ya--Don't know how it works, but I saw a rainbow puffle! 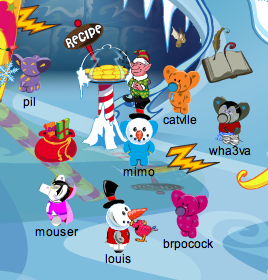 Some former member at the dance club was showing it off--basiclly, it's all the puffles in one long pattern. It's green! It's purple! Black! White! You might want to check into it... Oh yeah, and my username is "angelginger". MIMO TIL THE END! Hi mimo its me Dark ninja52 witch is my penguins name but anyways when you go to the moutain you see a shake kind of building down at the bottom left corner and ive checked and that isent the ski lodge so i think there might be a room there someday! At the Dojo Courtyard there is a Card- Jitsu Fire Video! Anonymous. Me too. Im new there. Maybe In The future Ull Know.